Plot: Our movie begins with a secret rocket test that ends with it crashing in the South Pacific. 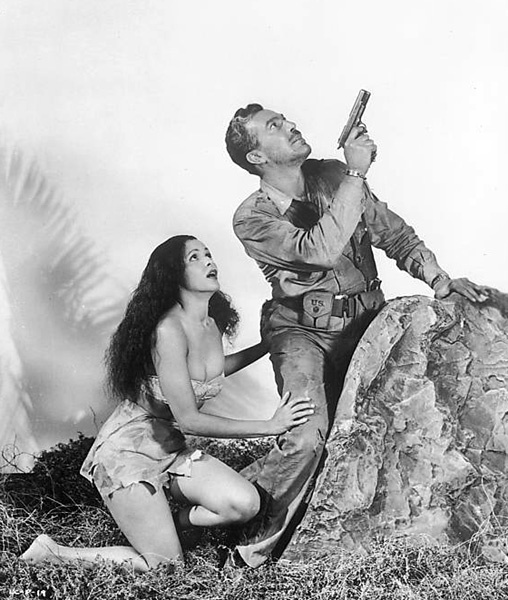 Three scientists (John Hoyt, Whit Bissell and High Beaumont) join a rescue mission headed up by ladies man Maj. Joe Nolan, the reluctant Lt. Danny Wilson and comic relief Sgt. Willie Tatlow. When their plane loses power and crashes on an island, they discover the rocket is there atop a mountain full of uranium and, yes, dinosaurs. Personal Thoughts: On the surface, this movie would seem to have a lot going for it. A good cast with a younger Romero in the prime of his lady killer days portraying a good hero. You’ve got a questionable scientist, a weak one who you know should be wearing a red shirt for this mission and the comic relief. 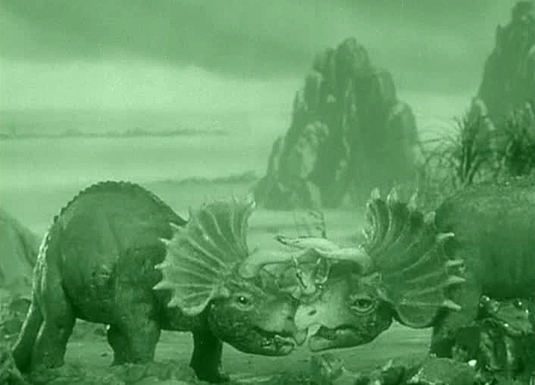 Add in a cameo appearance of Aquanetta as a pretty native girl and some dinosaurs and you should have a classic. Unfortunately, the script is a snooze fest with one of the longest plane rides this side of an Airport movie. However, when it comes to walking and climbing and more climbing, this flick is the winner (the word of the day is “padding”). And just how many cartons of cigarettes did these guys smoke during the movie? But let’s not forget the dinosaurs. Apparently, the Brontosaurus and Triceratops were really carnivores. And the T-Rex on the poster is nowhere to be seen. That said, the stop motion work isn’t horrible for the time and is actually quite graphic. The movie does switch over to a green tint for the mountain top sequences, which is also fun. But clocking in at nearly 85 minutes, this is a movie best played in the background as it never quite fulfills on the promises of the movie poster. The movie was shot in eleven days. About 10 ½ of those had to be of climbing and smoking. When Briggs falls to his death, the image of Rostov gradually disappears. Rostov is supposed to be Russian but John Hoyt speaks in what appears to be a German accent. Ever wondered what happened to the native girl and her brother? I guess we can assume she left after showing them the mountain. Hillary Brooke (Invaders from Mars, The Maze) received second billing as a love interest for Nolan despite only appearing in the film for a few minutes. Yes, there appeared to be one or two rock sets…shot from every angle possible…over and over again. 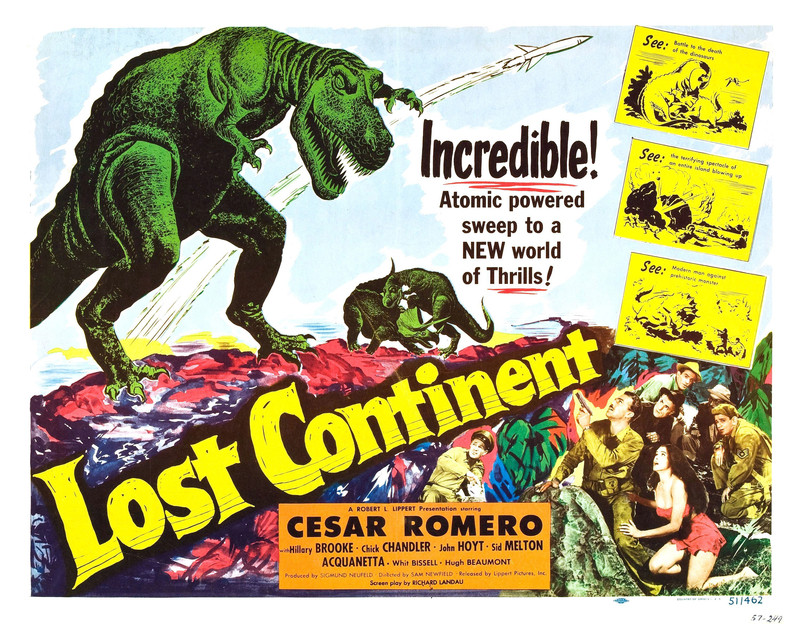 Availability: The Lost Continent is available on DVD at Amazon for less than $20. The print looks great, which helps you make it through the long sequences between the action. Check out the trailer on YouTube or watch it for free with either Spanish subtitles or in the Mystery Science Theater 3000 version (sorry, no green tint here). It does cross over into the “so bad it’s good” category. This one isn’t quite forgotten but maybe it should be? Plot: In these two-reel mystery shorts, The Shadow serves as narrator for quick mystery dramas. In Burglar to the Rescue, a banker is using bank funds to spoil his mistress when a previous victim of his scheme breaks out of prison for revenge. In House of Mystery, it’s a classic tale of an extramarital affair and retribution…or is it? And finally, in The Circus Show-Up, a trapeze artist is murdered and a detective must determine which of the circus folk committed the crime. 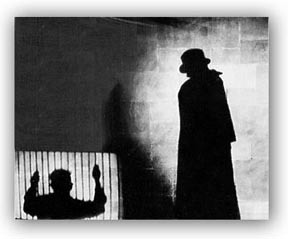 Personal Thoughts: Before Orson Welles brought The Shadow to life on radio in 1937 and even before Walter B. Gibson created the character for The Shadow magazine in 1931, The Shadow was a narrator of crime and mystery thrillers on the Detective Story Hour. The radio program was launched in 1930 with The Shadow as host of the stories. It was only after listeners began asking for a magazine that the publishers, Street and Smith, launched The Shadow magazine and the character began to feature in the stories. 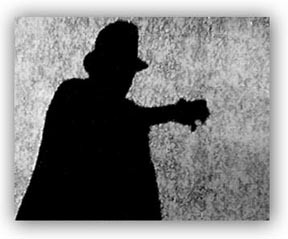 In 1931, Universal Pictures launched a series of six two-reel murder mystery shorts with The Shadow as narrator. Frank Readick, who was the voice of The Shadow on air, is uncredited as the voice in these shorts. However, I am personally doubtful that Readick did the voice in all three that I watched. It sounds like his voice in the first short, Burglar to the Rescue, but the voice is quite different in the other two. It is more likely that another actor assumed the role once production moved from New York to Hollywood with the second short. It’s also doubtful he provided the shadowy figure we see on screen. The Shadow plays a bigger role in the first short, with reduced screen time in the other two. Don’t expect too much of the familiar “crimes does not pay” avenger here as he comes off more like The Whistler. That said, I found these shorts actually quite entertaining and well worth the time tracking down. The stories are rather simplistic but with less than 20 minutes to tell the tale, there wasn’t enough time for more than what they offered. When Orson Welles took over the expanded role in the 1937-1938 radio season, he did not do the voice on the opening and closing narration. Frank Readick’s recorded voice was used. In the fall of 1938, Bill Johnstone took over the lead role and did new opening and closing narrations. 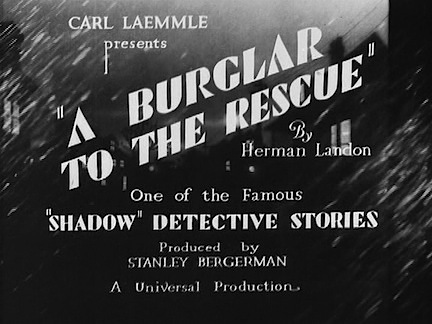 The Shadow returned to the screen in 1937 as the main character in The Shadow Strikes. He was last seen in the 1994 Alec Baldwin movie. Despite an announced film from Sam Raimi, the film project has been canceled following the inability to create a script worthy of The Shadow. Never released commercially, these short subjects are rare but available on a DVD from Sinister Cinema. I was legitimately surprised by the good quality considering how rare these shorts are. For $13, these are well worth adding to your collection. Plot: The Brewster sisters are two kindly old ladies who invite everyone into their home for a cup of tea and conversation. However, for the lonely traveler, they’ll break out the elderberry wine. But don’t worry, they’ll make sure you get a Christian funeral in the Panama Canal in their basement. Personal Thoughts: Everyone should know the classic stage play tale of the two old women who kill travelers with their special elderberry wine laced with arsenic. The 1944 film starring Cary Grant is so much fun to watch but I’ve always wanted to see Boris Karloff recreate his stage role, something he was denied of doing in the 40s. Several years ago, I became aware of a 1962 Hallmark Hall of Fame television special where Karloff recreates his role of Johnathan Brewster. Having finally seen it, I can say it was quite enjoyable. It’s great to see Karloff having fun with the role and Tony Randall turns in a great performance as well. Tom Bosley is the crazy Teddy Roosevelt wannabe charging up the stairs and does a fine job as well. With the original Hallmark commercials intact, this made for a very fun 90 minutes. It was apparently done live, so it comes off a little stagey but considering it’s based on a stage play, it works incredibly well. There have been countless versions of this over the years. The 1944 theatrical film version with Cary Grant is the most well-known and while Raymond Massey did well in the role of Johnathan Brewster, Karloff would have been better. However, the movie was actually filmed in 1941 while Karloff was still doing the original stage play and was unable to do both. 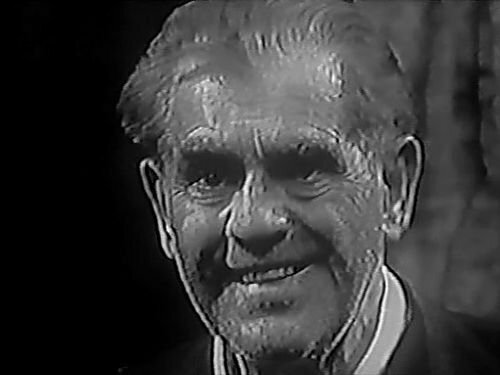 This TV version was made during Karloff’s run as host and sometimes star of Thriller. Never released commercially, this version of Arsenic and Old Lace is available on DVD through a third-party seller on Amazon. It appears to be a VHS dub and it’s definitely not a remastered version but considering the source material and how rare it is, the flaws are easy to overlook. Highly recommend Karloff fans add this to their collection. 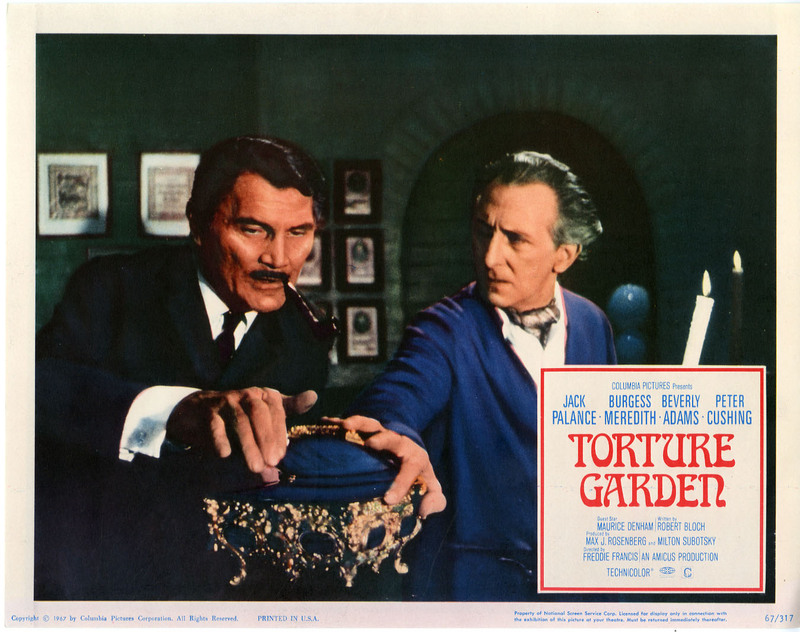 This on the Dread Media podcast, it’s time for some Amicus fun with Torture Garden (1967). Listen to episode 467, check out the trailer on YouTube and, if you’re so inclined, the flick is available for less than $10 on Amazon. And be careful of carnival sideshows! Plot: Charles Marlow is a man on a journey up the Congo to find his adoptive father who has disappeared. Along the way, he discovers his internal struggles about his love for his adoptive sister in this interpretive version of the classic tale. Personal Thoughts: Based on the 1899 novella written by Joseph Conrad, this televised version varies quite a bit from the original source material. The novella, originally published as a three-part serial in Blackwood’s Magazine, followed Charles Marlow on a voyage up the Congo in search of ivory trader Kurtz. This is a 90-minute production as part of the Playhouse 90 television series. Therefore, a lot of content had to be written out or condensed. Stewart Stern adaptation added a back story where Marlow was Kurtz’ adopted son and the struggles he had with a forbidden love for his adopted sister Maria. It isn’t until the final act that the story even comes close to resembling Conrad’s work. McDowell turns in a great performance as Marlow and Karloff is fun as Kurtz, saying the iconic final words, “The Horror! 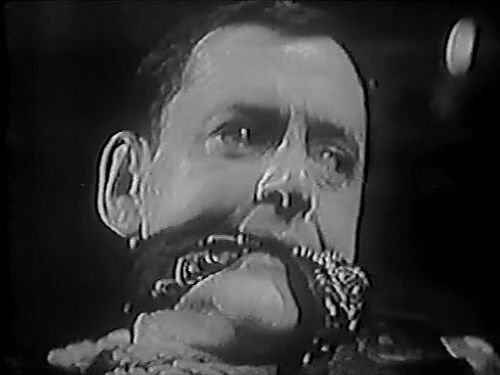 The Horror!” However, the production comes off as a poor stage play, even by 1958 standards, and the story is admittedly a little hard to follow with Stern attempting his best to recreate Shakespeare when he would have been suited to stick to Conrad’s original story. Heart of Darkness was adapted again in 1979 in Francis Ford Coppola’s Apocalypse Now, changing the setting from the Congo to Vietnam. The most recent adaptation is a forgotten made-for-TNT 1993 television version that starred Tim Roth as Marlow and John Malkovich as Kurtz. 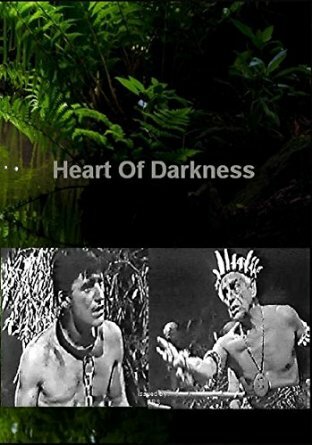 Never released commercially, Heart of Darkness is available through a third party seller on Amazon. However, unless you are a purist Karloff fan looking to add to your collection, watch this one for free on YouTube. The quality is a little rough but it features original commercials from channel 2 WCBS in New York which enhance the experience. 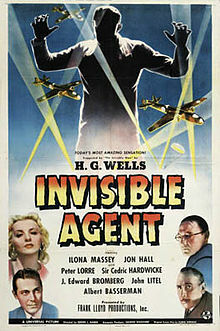 This week on the Dread Media podcast, I take a look at what I think is the one of the better of the Invisible Man sequels, Invisible Agent (1942). Peter Lorre turns in another classic performance, if not a little politically incorrect. Take a listen to episode 466, check out the trailer on YouTube, some cool Svengoolie facts and add it to your collection. It doesn’t get any better than a Universal Horror film!